A team headed by Robert Brown, BEI director, has been awarded a patent for bio-oil fractionation. “We have built much of our research around this technology,” Brown said. The patent, number US 8,476,480, was awarded in July 2013 to Brown; Samuel Jones, a former scientist with BEI’s Center for Sustainable Environmental Research; and Anthony Pollard, a former graduate student of Brown’s. The invention was developed with funding from the U.S. Dept. of Energy and the USDA. The patent covers multi-stage fractionation of bio-oil vapors created by fast pyrolysis of biomass. 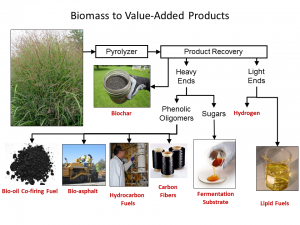 The process promises a way to convert biomass into many value-added products. These include a bio-oil co-firing fuel that can be used in coal boilers as well as materials that can be used to produce “bio-asphalt” and carbon fibers. Some of the fractions in Brown’s process can be catalytically upgraded to “drop-in” transportation fuels as well as commodity chemicals, and other biobased products. The process also produces sugar and acetate that can be fermented into ethanol and lipid fuels. Biomass, such as agricultural and forestry residues, is a major underutilized product in the world. 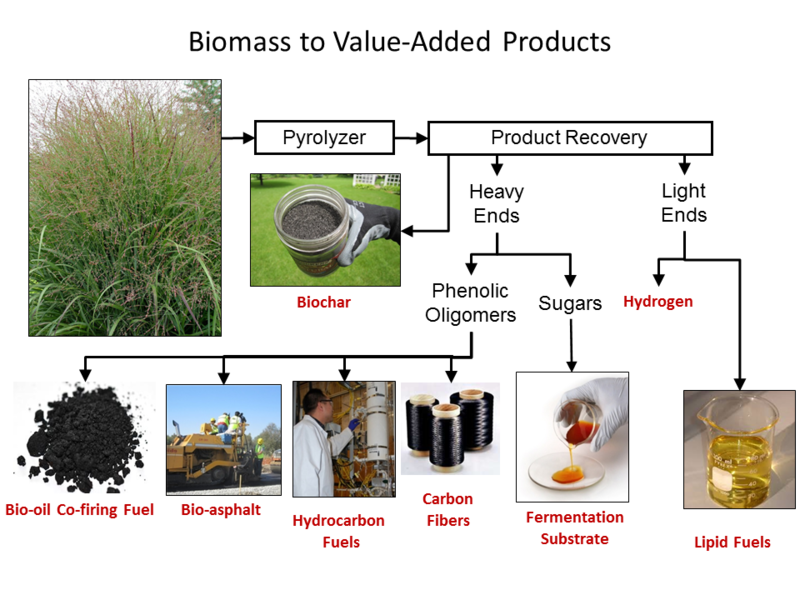 There are several different technologies for converting the biomass to useful energy or to biobased products, in particular bio-oil. Depending on the type of process used, the final product may have different values and applications. In most cases, these products replace those generated from crude oil and have long-term sustainability and environmental benefits such as being carbon neutral. Bio-oil, however, has two main drawbacks as a high-grade fuel for transportation and other applications. For one, bio-oil is highly acidic, which causes corrosion of pipes, tanks, and engines. And, bio-oil has high oxygen content, which decreases its heating value well below that of traditional petroleum fuels. BEI director Robert Brown led a team that has been awarded a patent for bio-oil fractionation, a key technology for the conversion of biomass into a range of valuable products. The bio-oil fractionation method invented by Brown and his team are an attempt to overcome these hurdles. The process starts with fast pyrolysis, rapidly heating biomass in the absence of oxygen (thus, bio-oil is also known as fast-pyrolysis oil). Traditionally, pyrolysis vapors are rapidly condensed in a single operation, creating traditional bio-oil. This approach is employed to prevent secondary reactions that convert the vapors into undesirable products. With bio-oil fractionation, however, the vapors are condensed in multiple stages, or fractions, resulting in various products. The patent details how the vapors are recovered in five stages, where each condenser stage has a unique coolant temperature. This approach allows for selective condensation and collection of bio-oil, allowing water and acid to be separated during the process, resulting in a much more usable and valuable oil. The technology has been exclusively licensed. View the PDF of the patent.